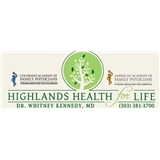 Highlands Health for Life (Denver) - Book Appointment Online! What to expect from an appointment with us? You will start by coming to our comfortable building where you will check-in and enjoy a brief wait in our relaxing waiting room. Next you will be invited back to the exam rooms where Kelly will get your vital signs and get you ready to see the doctor. Shortly thereafter, Dr. Kennedy will meet you in the exam room and practice family medicine at its finest. She believes it is very important to schedule ample time to see patients and discuss their conditions. This was my first visit. I liked Dr. Kennedy right away. She is knowledgeable and understanding. She is a good listener and takes your concerns seriously. The staff is great, too. I will definitely go back!